StemcellsafariReportsMesenchymal Stem Cells: How do they work? MesenchymalStem Cells: How do they work? created and recreated over and over as new stem cells are recruited to build the predetermined structure. numbers, then they are used for their regenerative capacity. 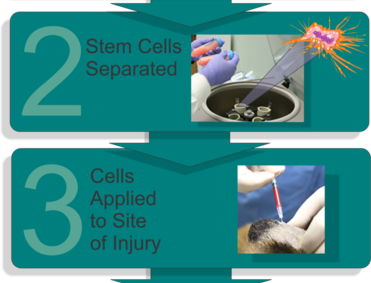 The MSCs accomplish their effects in separate ways; either through expansion, differentiation or by orchestrating tissue regeneration. This is true for both stem cells naturally recruited in vivo and cells which have been harvested and implanted. How do these MSCs “know” what to build? Protection . The niche hosts the stem cells so that they are protected from exposure to detrimental environmental influences that may cause precocious differentiation; premature conversion to another cell type with subsequent loss of the stem cell line. Hosting means there are other cells supporting the stem cells organized in two general types of niche – stromal niche and epithelial niches (2). messages. micro RNA is an example of such a signal that may affect the activation of genes in the stem cells (3). ECM adhesion between stem cells and the basement membrane determine the orientation of mitotic spindles, (5) (6). These types of anchorage largely determine the type of cell division, e.g. asymmetric vs. symmetric. In the natural state, stem cells are protected by the niche to prevent differentiation and to maintain their numbers (self-renewal) through symmetric division. The niche nurtures the stem cells in a state of protected suspended animation ready to respond to the need for tissue regeneration. Stem cells respond to stress and cell death by differentiation. Asymmetric division of a stem cell occurs when the daughter cell is different from the mother cell. Differentiation is when a stem cell changes through cell division to become a more mature adult functional cell. Asymmetric differentiation is undesirable if you are a stem cell in your niche, hence the purpose of the niche is to protect the cell from factors that would stimulate such asymmetric division. In clinical practice on the other hand, we want the stem cells to differentiate into the proper adult tissue cells. We take the stem cells out of their natural niche and place them into a comparatively hostile environment where all the normal cells are gone, and the only cells left may have disease or have died. It is in this environment that the stem cell must thrive to rebuild the predetermined structure dictated by the chemical signals contained in the ECM. While the niche protects the stem cell to prevent asymmetric differentiation, the matrix contains the information that the stem cell must use to “know” what to build and how to build it. The matrix promotes productive asymmetric division and differentiation. The matrix contains the map; the blueprint for the structure to be regenerated. The ECM remains when the cells are gone, the ECM orchestrates the regeneration of the tissue by directing the DNA of the stem cell through its storehouse of chemical signals. Cell division is either symmetric (resulting in identical twin daughter cells) or asymmetric (resulting in cells different from the mother cell) and is determined by the niche, the ECM and other intrinsic and extrinsic factors. When stem cells divide symmetrically in their niche they undergo “neutral competition” for niche occupation and the loser is expelled from the niche to undergo differentiation (7). This process maintains the number of stem cells when some are lost to natural causes such as aging or in replenishment of lost cells as occurs in the normal turnover of intestinal epithelium or dermal turnover in the skin. Asymmetric division of stem cell can be predetermined intrinsically, or the outcome may be extrinsically determined. Intrinsic asymmetry refers to the case where an individual stem cell divides to produce two daughter cells with distinct fates: one remains as a new stem cell and the other commits differentiation. In this case the fate of the daughter cells is predetermined by the stem cell’s DNA at the time of division. Extrinsic division asymmetry occurs when the fate of the daughter cells is not predetermined but is unpredictable and determined by the niche architecture or ECM which directs and facilitates the outcome of the division. Some stem cells may be lost through differentiation and some stem cells can expand to replace the lost stem cells. The fate of the stem cells in this case is determined by the external environmental need for cells. This extrinsic fate determination and differentiation is common to the therapeutic application of stem cells. Stem Cell Therapy is novel for most veterinarians and here I will attempt to offer some guidelines for how to approach stem cell therapy given these new understandings. Adipose derived mesenchymal stem cells are the most available stem cells for therapeutic application for veterinarians. The fatty tissues contain an abundant supply of stem cells. Briefly: 60 to 100 gm of fat is surgically harvested from the falciform ligament or from the subcutaneous areas such as the area caudal to the shoulder or in the inguinal areas of fat accumulation. This fat is then minced and digested with collagenase, incubated and centrifuged to separate the fat from the cells. The cells are washed and filtered to remove non-cellular debris. They are then counted, tested for viability and immediately administered as a therapy. 2% to 5% of these cells will be stem cells and the rest are considered stromal vascular fraction (SVF) cells. This sample size will yield about 100 X10 6 live cells or about 5 X 10 6 actual stem cells. This process takes less than two hours and can be performed in many clinical settings. The stem cells and their supporting cells have now been removed from their important supporting structures; gone is the extra cellular matrix, gone is the cell to cell interfaces important in preventing precocious transformation, differentiation or division of the stem cells. Remember the niche is the place that protects the stem cells and they are now removed from their niche. This process of removing the cells from their home activates the cells, making them ready to do work. Now they are ready to adopt the instructional blueprint contained in the extracellular matrix of the location they are now placed into. Culture of the SVF cells is relatively easy because these cells stick to plastic. Growing them and passing them through three generations renders them non-immunogenic allowing for allogenic administration. The ability to use “Donor” cells for off-the shelf therapy can revolutionize a practice, putting new tools in the hands of practitioners. Cellular therapy can be targeted to specific organs or areas of disease. In the case of arthritis, the stems cells function as repair agents to regenerate chronically damaged tissues . In subacute to chronic immune mediated disease involving T cells and the major histocompatibility complex stem cells can help reset the immune reaction and autoimmunity. In more acute or peracute disease such as trauma to the CNS or spinal cord, the secretions of the stem cells are very anti-inflammatory and promote neo-vascularization. Cellular therapy for arthritis is the most common application in veterinary practice. In addition, many musculoskeletal diseases can be treated effectively, including cruciate ligament disease, meniscal disease, biceps tenosynovitis and medial shoulder instability. Stem cells can promote rapid healing in acute and non-union fractures. The SVF cells are injected into the affected joints or damaged tissues using known techniques and landmarks or guided by fluoroscopic equipment. Direct injection of stem cells into affected diseased organs is also effective such as for kidney disease, lacrimal glands and intervertebral discs. Stem cells can reverse diabetes by injecting properly differentiated stem cells into the liver. Stem Cells are also anti-inflammatory and promote revascularization of damaged tissues. This property is carried out through the release of a large variety of bioactive substances with autocrine and paracrine effects, called the secretome (8) (9). The secretome includes a wide variety of molecules, including proteins, growth factors, antioxidants, proteasomes, microvesicles, and exosomes, which target a multitude of biological targets (10) (11). Treatment of spinal cord injury either traumatic or as a result of Intervertebral Disc Disease (IVDD) or brain injury from trauma or stroke is very effective with stem cells. The cells may be given intrathecally or injected directly into the lesion. Stem cells may also be injected into degenerating discs in IVDD to regenerate and rehydrate these discs. Injections into spinal cord tissue is not harmful and promotes regeneration of neurons and support cells. Cellular therapy may also be used for immunologic diseases. MSCs demonstrate a very interesting aspect of immunomodulation, due to their broad action capacity on Helper T Cells Type 1, and Helper T Cells Type 2 responses (12) (13) (14) (15). In fact, it is considered that one of the major MSCs’ immunomodulation mechanisms is the regulation of T cells— both CD4+ and CD8+— by cell-to-cell contact and inhibitory molecules of their secretome (12) (10) (15). This makes stem cell therapy valuable in treating immunological veterinary Illnesses. Intravenous injections of stem cells can be used in the treatment of allergic skin disease, asthma, inflammatory bowel disease, immune mediated hemolytic anemia, immune mediated thrombocytopenia, feline stomatitis complex and other immune system mediated disease. Stem cells are housed in a niche that uses three methods to protect the cells from premature division or differentiation. These three methods involve cell to cell hosting interactions, informational messaging interactions from the ECM and fate decision interactions involving how the cells are attached to the niche. These functions act to provide different actions of regeneration in the clinical setting as stem cells are used for therapy. The niche and remaining ECM of the new host tissue is used to provide the instructions for how the stem cells can asymmetrically divide to provide functional restoration and regeneration of tissue function. This is valuable in chronic disease state tissues. The immune modulation function of stem cells can help reset the self-not-self function of the T cells allowing for therapy of many subacute to chronic diseases where the body is attacking itself. The secretome of the stem cell is very anti-inflammatory allowing stem cell therapy to help in acute and per-acute injury of the CNS and to modulate blood flow in ischemia. Understanding the different uses of stem cell therapy is the first step in clinical application of this new tool in the clinical arsenal. The ground state of embryonic stem cell self-renewal. Ying QL, Wray J, Batlle-Morera L, Doble B, Woodgett J, Cohen P, Smith A. 2008, Nature, Vol. 486, pp. 519-523. Stem Cells and niches: mechanisms that promote stem cell maintenance throughout life. Morrison SJ, Spradling AC. 2008, Cell, Vol. 132, pp. 598-611. Mesenchymal stem cell-derived extracellular vesicles: toward cell-free therapeutic applications. Rani S, Ryan AE, Griffin MD, Ritter T. 44, 2015, Mol. Ther., Vol. 2015, p. 10.1038. What mouse mutants teach us about extracellular matrix function. Aszodi A, Legate KR, Nakchbandi I, assler R. 2006, Annu Reve Cell Dev Biol, Vol. 22, pp. 591-621. Adherens junction domains are split by asymmetric division of embryonic stem cells. Marthiens V, french-Constant C. 2009, EMBO Rep, Vol. 10, pp. 515-520. Adhesion molecules in the stem cell niche:more than just staying to shape. Marthiens V, Kazanis I,Moss L, Long K, ffrench-Constant C. 2010, J Cell Sci, Vol. 123, pp. 1613-1622. Intestinal stem cell replacement follows a pattern of neutral drift. Lopez-Garcia C, Klein AM, Simons BD, Winton DJ. 2010, Science, pp. 822-825. The current landscape of the mesenchymal stromal cell secretome: A new paradigm for cell-free regeneration. Konala, V.B.R., et al. 2016, Cytotherapy, Vol. 18, pp. 13-24. Mechanisms of mesenchymal stem/stromal cell function. Spees, J.L., Lee, R.H. and Gregory, C.A. 2016, Stem Cell Res. Ther., Vol. 7, p. 125. Uncovering the secretes of mesenchymal stem cells. Lavoie, J.R. and Rosu-Myles, M. 2013, Biochimie., Vol. 95, pp. 2212-2221. Stem cells: Insights into the secretome. Makridakis, M., Roubelakis, M.G. and Vlahou, A. 2013, Biochm. Biophys. Acta, Vol. 1834, pp. 2380-2384. Comparing the Immunomodulatory Properties of Bone Marrow, Adipose Tissue, and Birth-Associated Tissue Mesenchymal Stromal Cells. Mattar, P. and Bieback, K. 2015, Front. Immunol., Vol. 6, pp. 85-86. Mesenchymal stem cells: emerging mechanisms of immunomodulation and therapy. Glenn, J.D. and Whartenby, K.A. 2014, World J. Stem Cells, Vol. 6, pp. 526-539. Mesenchymal stem cells and adaptive immune responses. Cao, W., et al. 2015, Immunol. Lett., Vol.168, pp. 147–153. Mesenchymal stem cells: A friend or foe in immune-mediated diseases. Gazdic, M., et al. 2015, Stem Cell Rev., Vol. 11, pp. 280–287. Minimal criteria for defining multipotent mesenchymal stromal cells. The International Society for Cellular Therapy position statement. Dominici, M., et al. 2006, Cytotherapy, Vol. 8, pp. 315-317.
International Society for Cellular Therapy perspective on immune functional assays for mesenchymal stromal cells as potency release criterion for advanced phase clinical trials. Galipeau, J., et al. 2016, Cytotherapy, Vol. 18, pp. 151-159. Mesenchymal stem cells: Immune evasive, not immune privileged. Ankrum, J.A., Ong, J.F. and Karp, J.M. 2014, Nat. Biotechnol., Vol. 32, pp. 252-260. Comparative analysis of human mesenchymal stem cells from fetal-bone marrow, adipose tissue, and Warton’s jelly as sources of cell immunomodulatory therapy. Wang, Q., et al. 2016, Hum. Caccin. Immunother., Vol. 12, pp. 85-96. Human bone marrow stromal cells differentiate into corneal tissue and prevent ocular graft-versus-host disease in mice. Sánchez-Abarca, L.I., et al. 2015, Cell Transpl., Vol. 24, pp. 2423-2433. Mesenchymal stem cells: Environmentally responsive therapeutics for regenerative medicine. Murphy, M.B., Moncivais, K. and Caplan, A.I. 2013, Exp. Mol. Med., Vol. 45, p. e54. Comparative analysis of paracrine factor expression in human adult mesenchymal stem cells derived from bone marrow, adipose, and dermal tissue. Hsiao, S.T.-F., et al. 2012, Stem Cells Dev., Vol. 21, pp. 2189-2303. Comparative analysis of human mesenchymal stem cells from bone marrow and adipose tissue under xeno-free conditions for cell therapy. Li, C., et al. 2015, Stem Cell Res. Ther., Vol. 6, p. 55. Mesenchymal stem cells in corneal neovascularization: Comparison of different application routes. Ghazaryan, E., et al. 2016, Mol. Med. Rep., Vol. 14, pp. 3104-3112. Immunobiology of mesenchymal stem cells. Ma, S., et al. 2014, Cell Death Differ., Vol. 21, pp.216-225. Proteomic techniques for characterisation of mesenchymal stem cell secretome. Kupcova Skalnikova, H. 2013, Biochimie, Vol. 95, pp. 2196–2211. Concise Review: MSC-derived exosomes for cell-free therapy. Phinney, D.G. and Pittenger, M.F.2017, Stem Cells, Vol. 35, pp. 851–858. Immunophenotype and gene expression profile of mesenchymal stem cells derived from canine adipose tissue and bone marrow. Screven, R., et al. 2014, Vet. Immunol. Immunopathol, Vol. 161, pp.21-31. Extrinsic and intrinsic mechanisms by which mesenchymal stem cells suppress the immune system.Coulson-Thomas, V.J., et al. 2016, Ocul. Surf., Vol. 14, pp. 121-134. Mesenchymal stem cell-educated macrophages: A novel type of alternatively activated macrophages.Kim, J. and Hematti, P. 2009, Exp. Hematol., Vol. 37, pp. 1445–1453. ; et al. Applying extracellular vesicles based therapeutics in clinical trials—An ISEV position paper. Lener, T., et al. 2015, J. Extracell. Vesicles, Vol. 4, p. 30087. Delivery of bone marrow-derived mesenchymal stem cells improves tear production in a mouse model of Sjögren’s syndrome. Aluri, H.S., et al. 2017, Stem Cells Int. Adipose-derived stem cells as a tool in cell-based therapies. Bajek, A., et al. 2016, Arch Immunol Ther Exp (Warsz), Vol. 64, pp. 443–454.